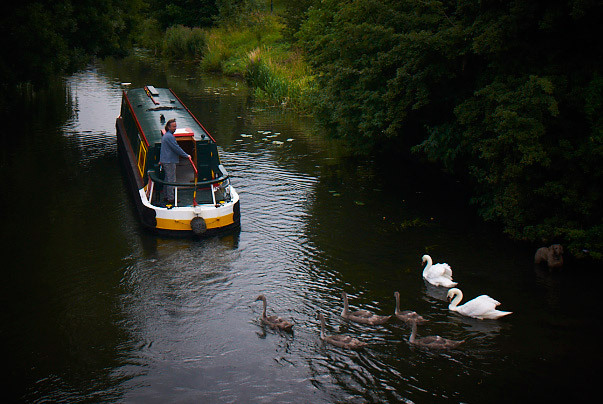 Once upon a time, when my family lived on a narrowboat, in a village in Hertfordshire, we gradually got to know the local swans, Bonnie and Clyde. For some reason they felt this was the appropriate call that should be used to summon the swans: And the swans came. Then the ducks came to try to fight for a bit of bread too. If there was any left over the big fat carp jumped up and had a bite as well. It was one of the loveliest luxuries of living on a boat to be friends with the swans; although it could be a demanding friendship at times. Clyde became bold enough to knock on the galley window with his beak if we were not on deck at a time when he wanted feeding. Once when I sat chatting with friends on the front deck he actually pecked me in the small of my back to let me know that he was there; ready and waiting for his bread. But where was Bonnie? When the winter was over and daffodils grew beside our boat Bonnie was nowhere to be seen. Eventually we discovered their nest beside the next canal bridge; safely on the offside, undisturbed by towpath walkers. There Bonnie sat and waited, guarding her eggs. Clyde glided protectively around her, on the surface of the water, with his head held high and aloof, surveying the area. If it was cold and raining I would grumpily say, “No,” and drag the girls back to the boat for mugs of cocoa. But mostly I would smile and say, “Yes,” and we would sit on the canal bank opposite the nest and watch, and talk about the swans. Then one Spring morning Clyde knocked on the bedroom window; Bonnie in tow, with three gorgeous grey fluffy cygnets too! I grabbed some bread and headed for the front deck calling for the girls as I went. Just one day earlier she had still been on her nest, so they must have been born that day and were straight in the water already! “This must be their first outing,” said my husband. So the girls threw bread, I took photos, my husband took a video and we gleefully announced the news of the birth to other passing boaters and walkers on the towpath. Find Swans and explore stunning wetlands, where incredible wildlife encounters take place everyday, set in the heart of the Fens.